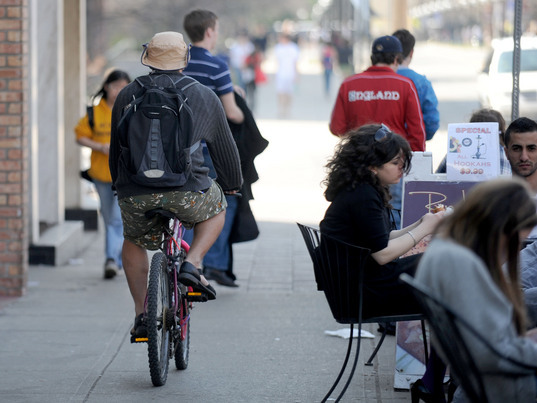 Accidents While Sidewalk Riding: Who's At Fault? Riding on the sidewalk - never a good idea. I got an interesting question from David today - unfortunately I was away from my computer when he asked the question so I couldn't respond to him personally. But it's a situation that I think deserves a post, so here goes. Hey Jamie my names David, I had a bit of a situation about a month ago and now its coming back on me pretty hard, and I was wondering if you had any insight. I was getting off of the olentangy bike trail onto third ave up near grandview and stayed on the sidewalk for a block before I got out into the road (traffic was flowing at a solid pace) I know now that I'm not supposed to ride on the sidewalk ever, but as I was pulling into the road a woman pulled out of the OSU Cancer research center and COMPLETELY blocked the crosswalk. having now where to go i t-boned her, and now, long story short, I'm being pursued to pay some ludicrous amount to fix her door. Is there anything you can think of that might be of some help to me? they told me i was going to have to shell out $1000 and now it seems like they want me to pay the whole thing! (almost $2500!) I'm a college student and i'm already just getting by as it is. As far as everything else goes, i was following the law. i had reflectors and lights. it just seems like she was just as at fault, considering the fact that she was all the way out past where she was supposed to stop. David was on the sidewalk to begin with, but was pulling out onto the road. A motorist pulled their car out too far, and blocked the crosswalk. This leads me to understand that David was in the crosswalk and was trying to pull onto 3rd Avenue. As much as I hate to say it, David was in the wrong here for his part. Although it's enforced about as much as texting while driving, sidewalk riding is illegal, and David admittedly was doing that. However, what I don't know is whether he should be held responsible for the entire amount as the driver in this case was blocking the crosswalk, which, if I understand correctly is legally considered an extension of the sidewalk. It seems to me, as a strictly non-lawyer type, that both parties are at fault here. I don't know how that applies to financial responsibility for a collision, though. If anyone with legal experience has an idea of how this should be handled, I'd love to hear it! Note: along with the comments here, we've got an interesting conversation going with this on Google+. Thanks John. I'm hoping to hear from Steve Magas, the Ohio Bike Lawyer, on this topic. Lot's of discussion at Jamie's Google Plus on this. Was there a red light for the driver? If so, she's required to stop behind the stop bar or crosswalk. Ohio is comparative negligence so the driver's failure to yield can influence the damages. Also can the cyclist talk to his own insurance company about this? Seems like there's a double standard in this city. Why is it that I see the Columbus Police riding their bikes on the sidewalk? In fact, of the dozens of times I've seen them downtown, I don't know that I've ever seen them in the street. Do they not know the law? I've been assaulted by motorists twice in the last two years. One of them said to me, "The cops ride on the sidewalk, so you should too." Thanks Columbus PD. Anonymous - I totally agree with you there. I've actually heard (and this is hearsay) people who've talked to the police about this, and were told that the bike officers are actually nervous about riding in streets. But as you said, the example they're giving is exactly what we DON'T need in this city - especially with more riders joining the fray every day. I'd prefer to see them in the streets, setting the example and letting everyone around them know the law, and the rights and responsbilities of the cycling community in this State. "4511.711. Driving upon sidewalk area. Nothing in this section shall be construed as prohibiting local authorities from regulating the operation of bicycles within their respective jurisdictions, except that no local authority may require that bicycles be operated on sidewalks." So I think you can ride on the sidewalk, it is just strongly discouraged due to the increased risk of an accident. I don't read this that way. I'm reading that local authorities can allow it from a legal standpoint, but the police always have to follow the law. So if the local law says that bikes CAN ride on the sidewalk in a place, the police have to enforce the law. But no where can the law say bikes CAN'T ride on the road except as otherwise specified. So areas of town such as Morse Road going under I-71 are, in fact, illegal (where I believe the sign says that bikes must use sidewalk). "2173.10 - Riding bicycles on sidewalks. No person shall operate a bicycle upon a sidewalk, except for children's non-motorized vehicles as defined in section 2173.015 (A)(2), and at locations that the Columbus city council designates as bikeways or shared-use paths. (Ord. 1050-77; Ord. 2120-03 § 1 (part); Ord. 0950-2008 § 1 (part); Ord. 1987-2008 Attach. 1 (part).) "
Right. Columbus actually has a sign that tells people to break its own law on Morse Road, going under I-71. Make sense to you? Me either. I've been on Morse at 71 but I guess I wasn't paying attention to signage because I didn't see it. But I wanted to reply to the comment about CPD riding on the sidewalk. I was driving across High Street in the campus area one evening and the cops actually road from the sidewalk, into the crosswalk, and then darted out in front of me into the road, causing me to have to hit the brakes. What a poor example to be setting. If you are riding on the sidewalk in an area where sidewalk riding is banned then, yes, you are subject to getting a ticket. This does NOT mean that cars may drive willy nilly and run over you. If you crossing the street on a bike, moving from sidewalk to sidewalk, in an area where sidewalk riding is banned and you are struck you are NOT "automatically" totally at fault. To me the proper analysis is to look at ALL the circumstances - was the cyclist "conspicuous" and "visible" to the motorist? Did the motorist have a green light or was she/he turning right on red? (2) Unless a sign is in place prohibiting a right turn as provided in division (C)(5) of this section, vehicular traffic, streetcars, and trackless trolleys facing a steady red signal may cautiously enter the intersection to make a right turn after stopping as required by division (C)(1) of this section. Such vehicular traffic, streetcars, and trackless trolleys shall yield the right-of-way to pedestrians lawfully within an adjacent crosswalk and to other traffic lawfully using the intersection. The official detour for the Olentangy Trail construction uses some sidewalks and two crosswalks. The city code does say you can't ride on a sidewalk _unless_ the city declares it part of a multi-use path, so I guess it's OK but reinforces the wrong ideas about where to ride. I think that side walks are for only pedestrians, thanks. Well in my opinion I think that sidewalks should only be for pedestrians. Thank you very much. Maybe the better solution to this is to make a bike lane for bikers. This will lessen the hassle that the pedestrians encounter while walking on the sidewalks. On the other hand, the possibility of bike-related injuries will also be prevented.